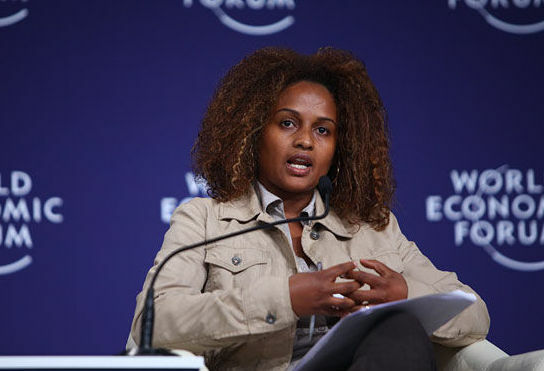 New York (TADIAS)- Our third highlight for Women’s History Month series is Bethlehem Tilahun Alemu, Founder & Managing Director of SoleRebels, the internationally recognized green footwear company based in Addis Ababa. Bethlehem was born, raised and educated in Ethiopia. Since she launched her company in 2005, allowing for the creation of hundreds of local jobs, she has garnered international recognition. Last year she was named one of the World Economic Forum’s Young Global Leaders. And most recently Forbes Magazine declared her one of Africa’s Most Successful Women. She is currently an NYC Venture Fellow, a program established by Mayor Michael Bloomberg two years ago that is designed to connect promising entrepreneurs from around the world with mentors and investors from leading companies in New York City. Below is our Q&A with Bethlehem Tilahun Alemu. TADIAS: What do you most enjoy about your work? Bethlehem Tilahun Alemu: I really love sharing Ethiopia’s artisan heritages with the world and combining our cultural products with modern design sensibilities. For example, our sandals and shoes are lined with fabric produced from organic cotton, which we hand-spin and loom. So working in this manner not only preserves local assets, but also provides our customers with stylish and comfortable footwear. And we are constantly taking our idea further and pushing the boundaries. TADIAS: Who are your female role models? BTA: My mother is my role model. A simple hardworking woman who taught me the value of hard, honest work, encouraged me to get a good education and supported my desire to dream! I am also surrounded by strong, talented creative women in my company, who put in a full day of honest work in order to both elevate this company and provide for their families. Their work ethic inspires me daily. TADIAS: What challenges have you faced as an entrepreneur and business executive? BTA: Any entrepreneur building something from scratch is bound to face obstacles and a myriad of challenges. Its been interesting because my experience in running my company has been a very positive one. I don’t feel limitations because of my gender nor allowed myself to be limited by others’ perceptions of my gender. However, I am well aware that there have been many times when people attempted to limit me because of my gender. My belief has been in never allowing those limitations to take hold. It always carried me through and let me transcend those obstacles placed in front of me. Such experiences have made me aware of the challenges faced by women, and has made me passionate about ensuring that women around me are given all the tools they need to not simply cope with these challenges, but to flourish in spite of them. At the end of the day, the best weapon for success is performance. TADIAS: What are some practical tips you can give for young Ethiopian women who want to follow in your footsteps? BTA: First and foremost, I would say get a good education. That’s critical. And never be afraid of hard work. Believe me there is no such thing as “overnight success.” So get ready for reality. And never ever be afraid to dream big. BTA: I was born and raised in the Zenabwork/Total area of Addis Abeba, which is one of the most impoverished and marginalized communities in Ethiopia. When I was growing up, Ethiopia had plenty of charity “brands” but not enough grassroots effort for development. I was fresh out of college in 2005 when I embarked to shift the discourse on development from one of dependecy only on foreign aid and NGOs to maximizing local talent and resources. Our vision was to provide solid community-based jobs while creating a world class brand, which we have done. TADIAS: Is there anything else you would like to share with Tadias readers that we have not asked you about? BTA: We are aiming to open at least fifteen stores outside of Ethiopia by 2015. we have already implemented franchise agreements in Taiwan and are currently finalizing retail proposals in China, US, UK, Australia, Italy, Canada, Spain and Japan. We have many more exciting initiatives in the pipeline so stay tuned! TADIAS: Thank you so much, Bethlehem, and Happy Women’s History month from all of us at Tadias! She is inspiring! We need more African women like her! I have followed Bethlehem Tilahun Alemu for the last few years and what she done absolutely remarkable! I wish you all the best Beth! Green and sustainable development is the future. Bethlem on the right track 100%! Go Bethelehem! I am truly enjoying your women’s histry series. very much needed. Thank you for what you do!